Life don’t get much better than this. Working in these areas is so very rewarding, I and my project manager Binod are just so lucky. But of course it is not all enjoyment. We spend days trekking and getting disappointed sometimes by the weather and the distance we have to go, and the time it often takes to fit everything in. 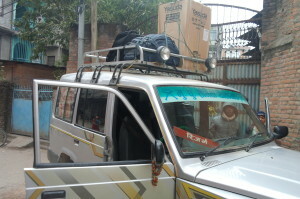 On the 23rd of November we packed up our van to go to Besishahar. We were taking computer equipment for 4 schools. It was not a comfortable journey, but I have experienced worse. The truck was very full sometimes items falling down at the back but we laughed all this off. We managed to stop for a very nice lunch so life was pretty good this day. As you can see we were also taking a fridge with us! We arrived at our flat quite late, we were tired, I managed to phone home to say all was ok. This trip is very stressful, there are so many accidents on this road, so many near misses. 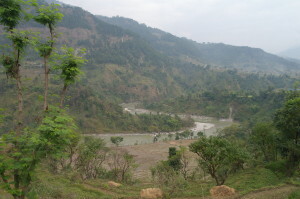 The road that we travel on to Besishahar is the main road from Nepal to India although over the years it has improved, it is still very dangerous, when you arrive at your destination you are just so happy to be there. Everything was unpacked and organised and we went to bed a very tired team, which consisted of myself, Binod, and our helper Bavram. 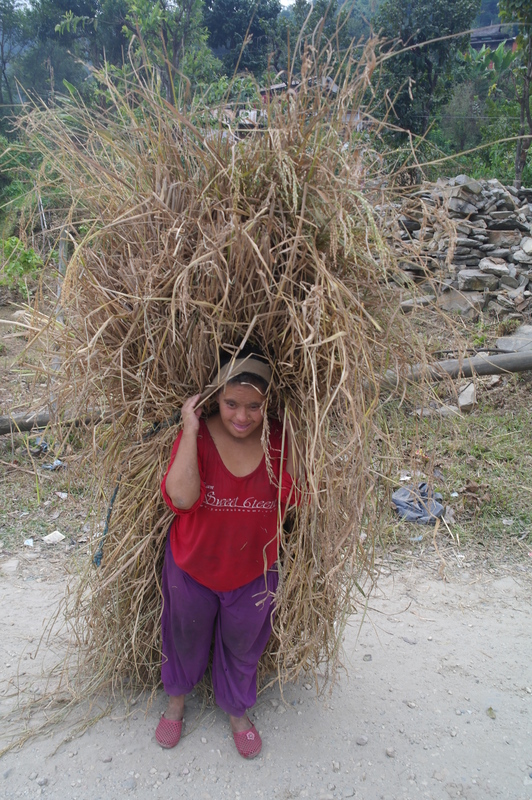 Bavram is from the village Bahundanda one of our Lamjung District supported villages. We use locals because it is sensible and helps the communities. The following day I wanted to get some training in so insisted that Binod and I trekked at a very fast pace to the next village. This would not be a hard trek as there would be little incline, but still it was 12kms. Firstly we organised for another truck to take the Computer Equipment up the mountains to the schools, we would follow on over the next few days. On our training trek we were looked at in a very strange way, as this was not where people trek!!! We encountered a very happy girl, as you can see she has Down’s syndrome. This is not recognised in the same way in Nepal as it is in the Western World, there is no special treatment or indeed allowances. How many times in my days in Nepal do I think how lucky we are in the UK. I hope this message gets to you. I spent a few weeks in Bahundanda earlier this year teaching English at the Chandrodaya school. I’m going to go back there in December for two months. 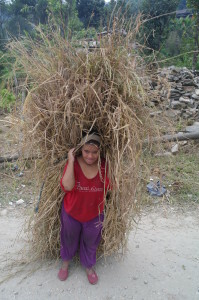 I heard quite a lot about you and the work you’re doing in Lamjung. I’d be interested to make contact with you.